I've avoided this style considering that its on the secondary brewing list planned for lagers to be ready for Oktoberfest (priorities are typically Oktoberfest, Pilsner, Helles, and a Vienna or amber-like lager) and two, bock requires a large grain bill, beyond my mash tun's capacity. The Lager Cave has eliminated the first barricade and with a 15 lb. limit tested during the Barley Wine brew, it was worth the shot to try to hit the target original gravity of Traditional Bock. I settled for a grain bill of 14.5 lbs. which eliminated any possibility of doing a multi-step infusion mash. 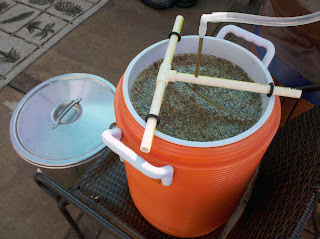 Just 1/2 pound more and my 5-gallon Rubbermaid mash tun is busting out its plastic seams. 14.5 lbs. has its toll but at least its manageable. After the brew day, we drove the bock over to the Lager Cave at Ed's and as you can see below, there's still room to spare (hmm, what to brew next!?). The Lager Cave has insane space! 0.45 oz. Magnum 60 min. I was impressed with your 14.5 lbs of grain. I have been scared to go over 13 because I didn't think I could stir it. So I was looking at your O.G. to see my possibilities and that doesn't seem right. Is your efficiency around 60%? Looks great and I'm a big fan of the malt profiles of beers that have Munich as the base. With that much grain, I always seem to lose efficiency to some extent. With a bigger mash tun, I would have had room to add another pound or so and manage to do a multiple infusion mash. I find that having a quick protein rest makes a big difference when using malts like pilsner, munich, and vienna. I've always used a plastic spoon and its very difficult to stir large grain bills and thicker mashes. Over time, I've developed a technique that distributes the temperature very well during stirring. It takes me about 5 minutes of work but it always gets the job done. Why do I need to make 5 gallons of strong beer? Can't I just make a 4 gallon batch with a manageable 13lb. grain bill and easily use a 5-gallon carboy for primary? I actually do something similar but for a different reason. 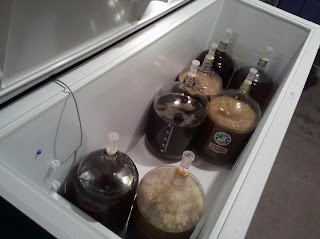 I only have a 5 gal carboy but I still want 5 gals of beer for my 2 - 2.5 gal cornys. So I calculate everything on a 5 gal batch size but I know that I just need to add .5g less sparge water. So I usually go into the carboy at 4.5 gals and about 10% higher gravity than I'm shooting for. And then boil water and top off to 5 gal after fermentation has calmed down.